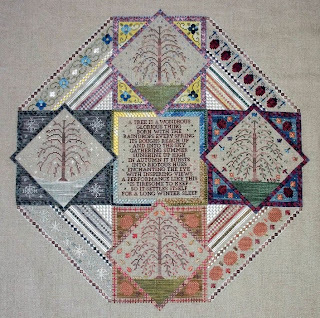 First, A Sampler of Seasons. I pushed through the tears and finally finished it after some 2 years of designing, redesigning and model stitching. As I said before, I had a hard time picking this one back up as it was the last design of mine that dad got to see, so finishing it has been both happy and painful at the same time. Retail price is $30 for the chart and all instructions. There are a lot of specialty stitches and lots and lots of diagrams - 45 to be exact. 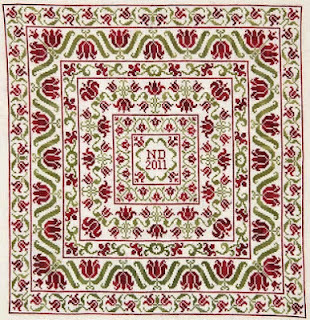 It's stitched in Valdani Silk Floss, and of course Valdani also does most of the same colours in cotton, but as always a DMC list is included. The DMC isn't as accurate as I'd like but for a lot of these colours there just wasn't much I could substitute. I did include descriptions of the colours so you could choose your own favourites if you wanted to. I used 34ct Wren Wing linen from Lakeside linens, but have also included alternative suggestions for fabric colours - and you could use any count you wanted of course. Second, is a re-release. 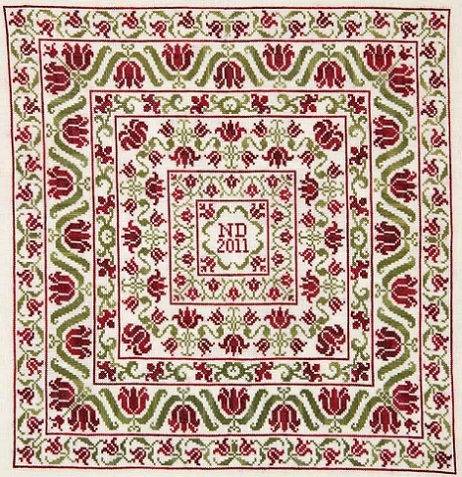 Tulip was originally released in Just Cross Stitch Magazine in March/April 2012. Retail price is $14. 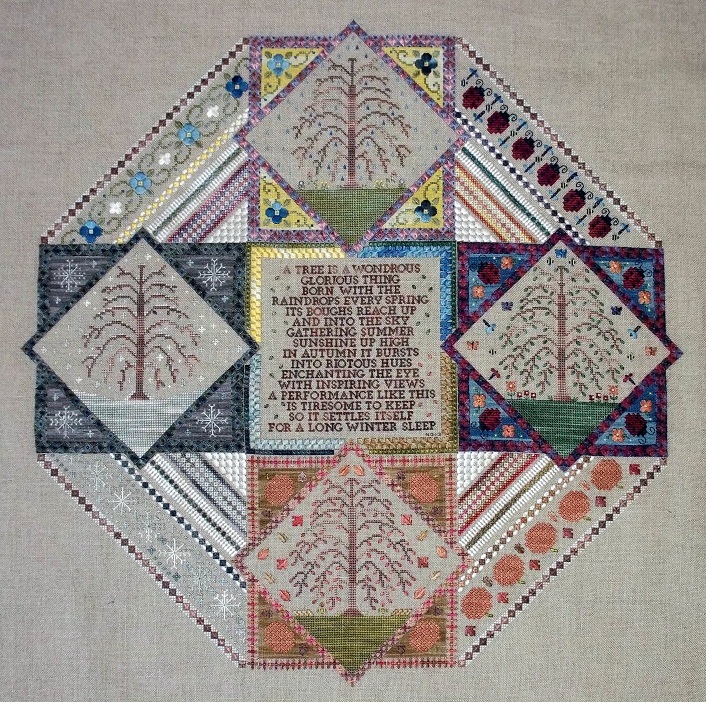 This one is all full cross stitch, and uses Crescent Colours Belle Soie Silk Floss on Lakeside Linens Magnolia Linen and a DMC conversion is included. A big huge thanks to May Khaw for model stitching this one for me. Both of these are shipping out to Hoffman on Monday, and I'm sending out the details to European Cross Stitch momentarily. They are also available directly from me, both wholesale and retail. Absolutely love the Sampler!!! When I have extra money this is going to be my first stitchy purchase! Thanks Jules! So glad you like it! what I wish was that floss was not just a color on a list but amounts also. 1 roll, or 2 rolls needed..